Recently my husband and I attended “A Conversation with Wil Haygood” hosted by Rodney Brooks and Jackie Greene, co-founders of Black Books & Reviews. 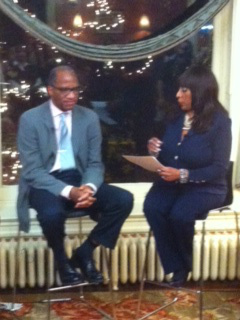 Sheila Brooks, CEO of SRB Communications, conducted the conversation with Mr. Haywood, the journalist whose story about Eugene and Helene Allen in The Washington Post inspired the movie “The Butler”. A surprise contributor that evening was Charles Allen, the Allen’s son. In addition to writing for the Post, Wil Haygood is a Guggenheim and National Endowment for the Humanities fellow who has written three other biographies: The Life and Times of Adam Clayton Powell, The Life of Sammy Davis, Jr., and The Life and Times of Sugar Ray Robinson. He is now promoting his new book, the New York Times Bestseller “The Butler A Witness to History”. I wish I could convey on paper how moving it was to hear Mr. Haygood speak of going to Mr. Allen’s home to meet with him and how they came to an agreement that Mr. Haygood would develop a piece about Mr. Allen and the years he worked in the White House. Mr. Haygood shared that when he asked Mr. Allen if anyone else had ever approached him about writing such an article – Mr. Allen responded that if Mr. Haygood found him (Mr. Allen) worthy, that he would be the first! Mr. Haygood also shared that it was Mrs. Allen who truly believed that her husband’s life was worthy of recognition. You could have heard a pin drop when Mr. Haygood went on to say that once the deal was sealed, Mrs. Allen bid everyone good night and went upstairs to sleep never to waken again. Mr. Haygood shared he had feelings of guilt that the excitement of having people in and out of their home to get the necessary photo shoot done was too much for her until her son Charles explained that he believed she had been “holding on” and once she knew her husband’s contributions would be recognized, she was free to "let go". The Butler was a great movie that for me brought to life the way things were in the world while Mr. Allen served in the White House from 1952 to 1986. I’ve heard people say they were disappointed in the extramarital affair of the wife in the movie, so it was great to hear Charles Allen say that although he approved of the movie; the portrayal of his mother was inaccurate in spite of the fact Oprah and Forrest Whitaker captured many of their mannerisms. Also it was interesting to learn Charles Allen is an only child; there were two sons in the film. In fact, Lee Daniels, the director of the film, wrote in the book’s foreword, “While the movie The Butler is set against historical events, the title character and his family are fictionalized”. Mr. Haywood’s new book is the true story of Eugene, Helene and Charles Allen and the hard road involved in bringing The Butler to the big screen. Not only is this book a great read but also the original pictures provided by the Allen family are fabulous. I urge you to buy several copies of and share them with your family and friends as Christmas presents. To close the evening, Mr. Allen recounted a time when a church was looking for people to spotlight for career day and his father put together and submitted a resume of sorts, but he was not chosen because the “powers that be” deemed his job demeaning. How wrong they were!! !